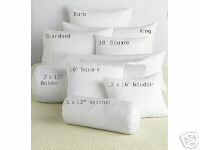 Decorator pillows created especially for those who may be sensitive to down yet desire the luxury and comfort. This fiber is smaller than the size of a human hair that mimics down's superior loft quality making it the perfect alternative to down. Also, this fiber is made with recycled plastics. On the outside your fiber is wrapped in a 230 thread count (50% cotton, 50% polyester) cloth ticking, double stitched edged for durability. Wash in a gentle cycle with a small amount of detergent (Dawn example) Dry on gentle cycle(add a couple of tennis balls for fluff). Remove from heat just before it is completely dry and air dry for remainder of time.